Extremism charges, tax claims were exploited here. 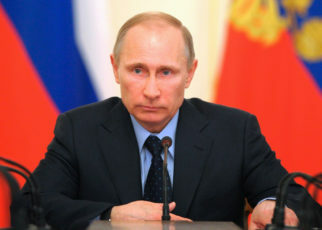 President Putin was personally involved in the operation. 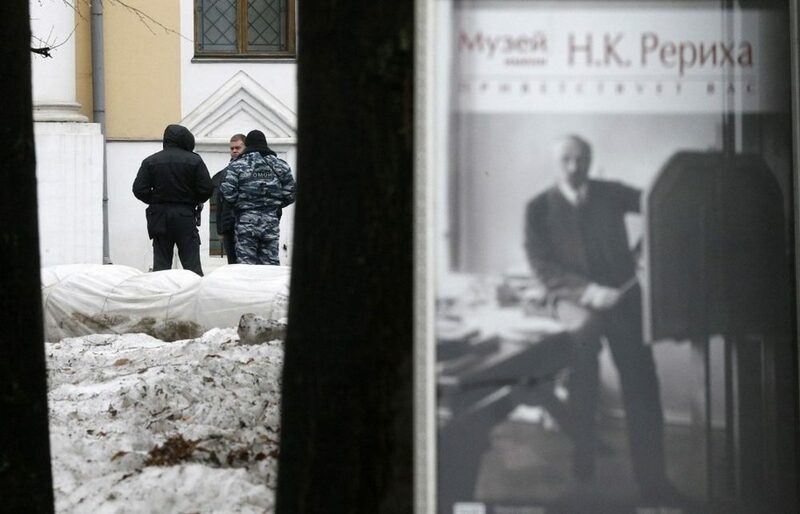 Is this a retribution for investigating the disappearance of Roerich paintings from the State Museum of Oriental Art? Late in the evening of April 28, 2017, there happened a fuss in the Lopukhins’ Estate in Znamensky Lane, literally opposite the Cathedral of Christ the Savior. The estate was stormed by strong men in uniform without military insignias, led by inconspicuous civilians. 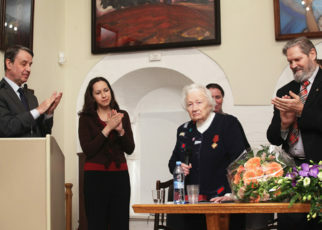 A concert by a Bulgarian pianist ended in the main building of the estate when the men in uniform took over the guard post. The police squad arrived in time and was watching it all silently and indifferently. All this time museum workers helplessly crowded around outside the gate, they were not allowed into the estate, even to pick up their personal belongings. 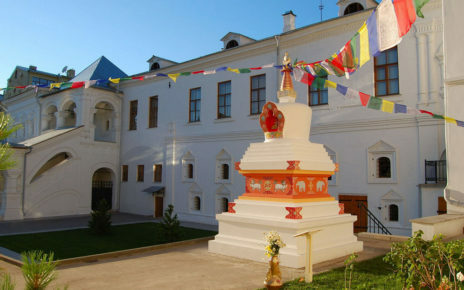 The Center of the Roerichs had been locating in the Lopukhins’ Estate for almost 30 years. These chambers became home for many workers. The next day, the head of the presidential Council on Human Rights Mikhail Fedotov, and a member of the Council on Human Rights Andrei Babushkin, arrived at the estate, attracted by the scandal. “We went to the territory of the museum to examine what was available to examine,” he told the reporters later. “Indeed, this was a unique building of the 18–19th centuries, everything was perfectly restored there without state funds but at the expense of the bank and donors. This was a unique center and a unique museum. The actions of the Ministry of Culture seem to me quite incomprehensible and posing a threat to such a non-governmental museum.” Andrei Babushkin said to journalists. Yes, that’s it, the employees of the Ministry of Culture and the State Museum of Oriental Art, the very people in civilian clothes, were behind the events that looked like a raid. The seizure of the estate is just another battle in the protracted war for the Roerichs’ heritage. Return to Russia was an unfulfilled dream and pain of Nicholas Roerich, the greatest Russian artist and thinker. He and his wife, the philosopher Helena Roerich, were not allowed to return to the USSR during their lifetime. Their son Svetoslav Roerich carried through his life the idea that the heritage of his parents should be transferred to Russia. And in 1987 in Moscow, Svetoslav Roerich met with Mikhail Gorbachev, when they agreed to create in the USSR a non-governmental Roerich organization that would preserve the heritage of our great compatriots. The social status of this organization was of fundamental importance for Svetoslav Roerich. 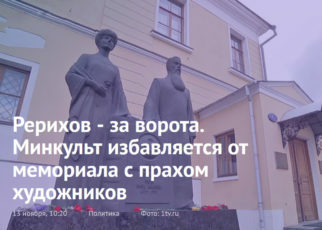 Later in his public discussion with Academician Rybakov he explained why in his view the Center of the Roerichs should not be subordinate to the State. “…The subordination of the Center to the Ministry of Culture and furthermore to the Museum of Oriental Art would unreasonably and wittingly narrow down the tasks and the opportunities of the Center. In my opinion, the Center must have significant independence, flexibility and the ability to function regardless of bureaucratic barriers, it should use new, non-traditional approaches and appeal directly to the international community. The Center is the creation of the new times and the new tasks…” The essence of the concept of the Center-Museum is that its most optimal functioning can go on in the status of a non- governmental organization… (July 29th , 1989, “Sovetskaya Kultura”). Resolution of the Council of Ministers of the USSR to create the Soviet Foundation of the Roerichs and a non-governmental Nicholas Roerich Center-Museum at the Foundation was signed in November 1989. 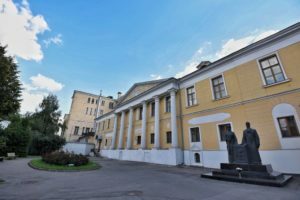 At that time the Executive Committee of the Moscow City Council transferred to the Nicholas Roerich Center-Museum the Lopukhins’ Estate to place there the Roerichs’ collection. The Estate was right opposite the Pushkin Museum. In 1990, the Roerichs’ heritage was exported from India to Russia according to the will of Svetoslav Roerich. By his will he included in the scope of the heritage transferred to the Soviet Foundation of the Roerichs 288 canvases, his own and those of his father, in order to create a non-governmental Nicholas Roerich Center-Museum. These pictures were brought to the USSR back in 1978, when the Ministry of Culture of the USSR requested Svetoslav Roerich to organize a traveling exhibition. According to the documents, 296 pictures, owned by Svetoslav Roerich, were brought to the USSR. This exhibition was travelling across many Soviet cities: Leningrad, Odessa, Lvov, Kiev, Vilnius, Moscow. 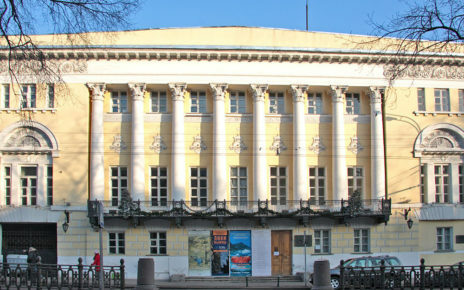 After its completion 8 works were returned to Bulgaria, where they were before the Soviet tour, and 288 ones remained in storage in Moscow, in the State Museum of Oriental Art. But the paintings were not returned. 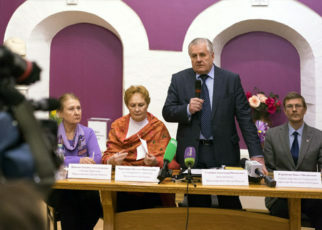 The Ministry of Culture explained its unwillingness to fulfill the will of the owner of the collection by the fact that after the collapse of the Soviet Union, the Soviet Foundation of the Roerichs, to which Roerich had handed over the collection, was transformed into the International Center of the Roerichs (the ICR). And this new organization, from the standpoint of the Ministry of Culture, allegedly was not the legal successor of the Soviet Foundation of the Roerichs. The Ministry did not take into account the will of the owner of the collection who was alive and well at that time. Obviously, foreseeing the capture of the heritage, Svetoslav Roerich shortly before his death, in addition to the will of 1992, assured his signature at his last disposal concerning the collection transferred to Russia. By this document, he in his lifetime gave the International Center of the Roerichs all rights to the heritage, which had previously been transferred to the Soviet Foundation of the Roerichs. In 1993, Svetoslav Roerich died. The development of the Roerichs’ ideas in Russia continued without his patronage. 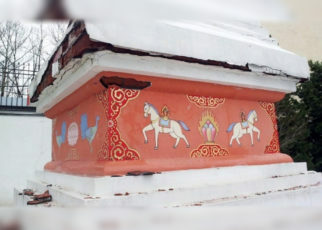 But it continued successfully, the plan of reconstruction of the Lopukhins’ Estate was developed, approved and implemented, a huge number of paintings and graphic works of the Roerichs were returned to Russia. But the most important work of all these years was progressing in another direction, the ICR went on pursuing to implement Svetoslav Roerich’s will regarding his collection, which remained all these years at the State Museum of Oriental Art. In 2001, the Court dismissed the claim of the International Center of the Roerichs to remove 288 canvases from the State Museum of Oriental Art. It was dismissed on a formal basis, for the Court decided that the International Center of the Roerichs did not have a gift deed by Svetoslav Roerich to collection, but only his will. And since the ICR had not implemented the procedure for the entry into inheritance rights, it couldn’t confirm its rights to inheritance property. Then the ICR applied to the Khamovnichesky Court to recognize its rights to inheritance. These rights were obviously confirmed by the documents of Svetoslav Roerich. Several times the courts secured the Roerichs’ legacy for the ICR, as many times as the higher authorities canceled these decisions, taking the side of the Ministry of Culture and leaving the collection at the disposal of the State. The litigation lasted until November 2011, when the Khamovnichesky Court finally recognized the inheritance rights for the ICR, and this decision entered into legal force. The main thing that worried the International Center of the Roerichs all these years was the safety of 288 paintings in the State Museum of Oriental Art. It was known that in 1996, obviously without having the intention to return the canvases, the State Museum of Oriental Art documented them for a permanent storage. However, a few years later, it was found that instead of 288 canvases, which were brought in 1978 to the USSR to be exhibited, there were only 282 ones kept at the State Museum of Oriental Art. There arose a troubling question where 6 paintings were gone. Indeed, in all the documents accompanying the traveling exhibition of 1978, in acts of acceptance and transmission by several Soviet museums at once, the list of paintings was more complete. How could the collection shrink? The State Museum of Oriental Art was checked for the missing paintings several times, both by the Accounts Chamber and Federal Service for monitoring compliance with cultural heritage protection law. But no violations were detected. Why? The fact is that the integrity of the collection was checked by registration cards issued by the State Museum of Oriental Art itself, without checking them with the title documentation of the collection owner. Of course, such revisions were doomed. But the ICR experts began their own investigation and they seem to come close to answering the question of reducing the collection. How, then, to explain the incident with the paintings of Nicholas Roerich “Tangla” and “Song of Shambhala”? In the list of paintings compiled by Nicholas Roerich himself, these two works of 1943 were listed as two separate canvases. But in the register of the State Museum of Oriental Art they suddenly merged into one, as “Tangla. Song of Shambhala”. The conclusion was obvious. It is a question of a criminal offense rather than a technical error in recording the paintings. And the ICR did not intend to back off. Food for thought. In 2013, Nicholas Roerich’s painting “Madonna Laboris” at Bonham’s New York auction was sold for $ 12 million. Representatives of Bonham’s house said that “Madonna Laboris” is the most expensive painting in the world of Russian art ever sold at auction. The scale of the alleged “oss by the State” obviously impressed the addressee, and he left an indestructible resolution on the letter, “To Konovalov A.V., Lavrov S.V. To take measures to ensure the interests of the State.” Presidential resolutions in Russia are known to have a magical effect on the courts and all kinds of executive bodies. In the same 2013, the Court again raised the issue of rights to the Roerichs’ heritage, for the issue was closed two years ago. The Court overturned the decision to recognize the ICR’s rights to the Roerichs’ heritage. But all these suspicions are nothing compared to the new accusation of extremism, because the recognition of an organization as an extremist one according to the law of the Russian Federation entails its liquidation and confiscation of all its property in favor of the State. In the summer of 2016, an unscheduled inspection by the Ministry of Justice was held at the International Center of the Roerichs to identify signs of extremism in the organization’s activities, as well as to recognize the Center as a foreign agent. This inspection of the Ministry of Justice was initiated again by order of the Deputy Minister Aristarkhov. For two weeks, the experts from the Ministry of Justice were studying thoroughly all documentation and publications made for three years, shaking up all papers of the International Center of the Roerichs, but discovered neither hints of extremism nor any basis to suspect the ICR in performing the functions of a foreign agent. Then the Ministry of Culture tried to eliminate the ICR under the extremist scenario. In the same 2016, the ICR had its film distribution certificate for the film “Call of Cosmic Evolution” withdrawn. The recall of the film distribution certificate took place on the initiative of Aristarkhov, whom Alexander Sedov, the Director of the State Museum of Oriental Art, addressed to with a letter. The ICR decided to sue in order to return the film distribution certificate to the film. Although lawyers warned that the risk was great. In case of detecting the signs of extremism in the film, the organization that created it could also be recognized as an extremist one and then the fate of the International Center of the Roerichs would be decided. After summing up all pros and cons, the Court decided to return the film distribution certificate to the film “Call of Cosmic Evolution”. But, the attacks on the ICR did not end there. In 1995, the dilapidated (at that time) buildings of the Lopukhins’ estate were transferred to the non-governmental Nicholas Roerich Museum for a long-term lease of 49 years provided that the ICR would ensure its scientific restoration. 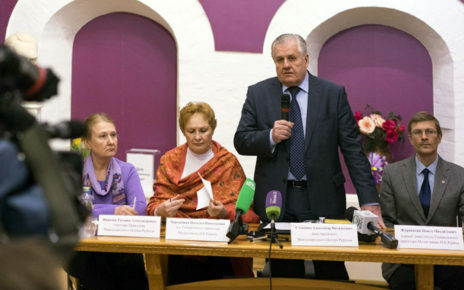 The Roerich center was a success to fulfill this condition, and in 2014 the Mayor of Moscow City Sergei Sobyanin assigned the right of gratuitous use of the estate’s buildings to the ICR. 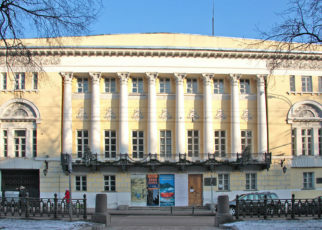 Until then, the Ministry of Culture made numerous attempts to acquire the old estate that was in Moscow City ownership. But not success. 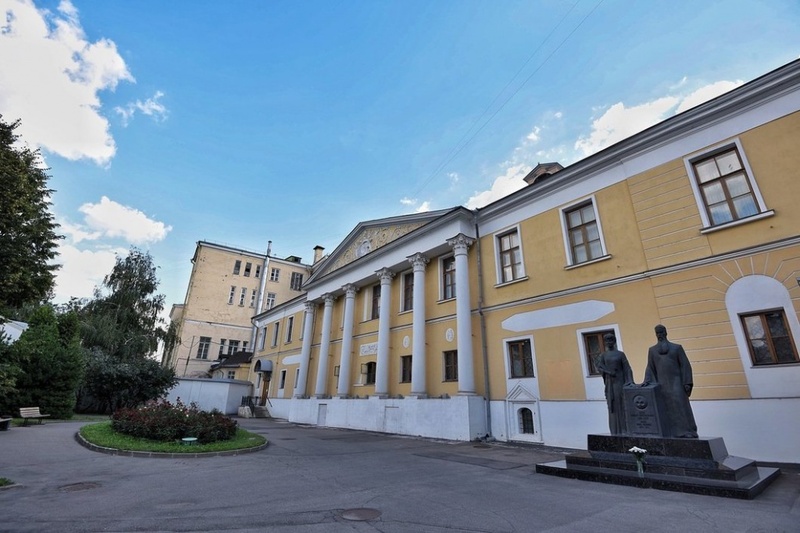 In September 2015, the Minister of Culture Medinsky asked the Mayor of Moscow City to transfer the Estate from the city ownership to the federal one in order to create a full-fledged complex on the estate territory for preserving and studying the Roerichs’ heritage. 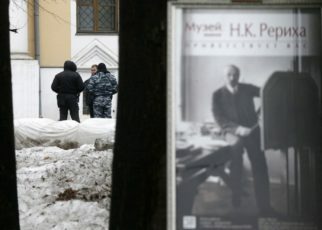 Moscow Mayor responded to the request of the Minister of Culture, and within a month the Estate immediately became an object of federal ownership. 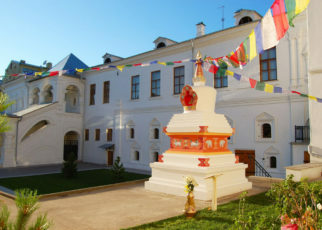 The Federal Agency for State Property Management, which now manages the Lopukhins’ Estate, transferred it to the operational management of the State Museum of Oriental Art “to create a Roerich center on its territory as an affiliate of the State Museum of Oriental Art”. The State Museum of Oriental Art, in turn, declared the contract of gratuitous use with the International Center of the Roerichs avoided, proving through court that the ICR had caused damage to the monument of architecture of federal significance that of the Lopukhins’ Estate. The trials delayed until 2017. The paradox of these processes was that the quality of the restoration works of the estate were highly regarded by numerous Russian and international experts. However, all these high marks did not impress the judges. The decision to avoid the contracts of gratuitous use of the buildings of the Estate with the ICR was made on April 7th, 2017. It would have entered into force on May 7th if the ICR had not appealed against it. And it had! But, without waiting for the decision enter into force or appeal, the Ministry of Culture proceeded to action. And on the night of April 28th, 2017, the Lopukhins’ Estate was stormed by people in unmarked uniforms, led by the employees of the State Museum of Oriental Art. In the next few days the museum was cleared of exhibits. Needless to say, that all of them were taken to the State Museum of Oriental Art. The loss of home, and even more so, the loss of the collection, has hit the International Center of the Roerichs hard. However, like any living organism that retains its dignity, the ICR continues to resist and doesn’t waste any time in order to investigate the fate of the missing paintings. And this means only one thing that the International Center of the Roerichs won’t be left in peace. And may the attempts to frame up the organization for extremism or for the “law on foreign agents” have failed, there is one more universal instrument of reprisal, that of bankruptcy. For the first time, the ICR encountered tax claims back in 2016, when at the initiative of the same Ministry of Culture, the Tax Inspectorate began a large-scale audit of the Center’s accounting documents. In the final act, the inspectorate counted about 60 million rubles of unpaid taxes with penalties and fines. How did this non-payment happen? 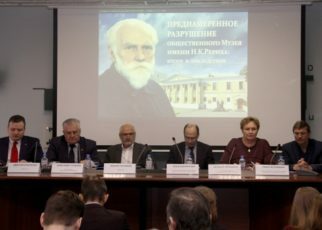 The Tax Inspectorate explained that cultural values, which were the main assets of the ICR, were subject to registration in the non-State part of the Museum Fund of the Russian Federation. And if this was not done, they were considered fixed assets and were subject to mandatory taxation. At the same time, the law does not require from non-governmental museums obligatory registration of artworks in the museum fund. However, the position of the Ministry of Culture here turned out to be stronger than the law. The attempts of the ICR to challenge the imposed fines were not success. The organization has no such money. 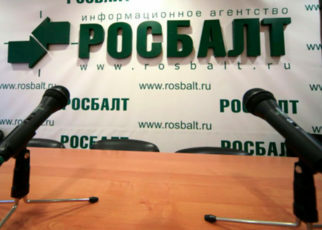 To date, the ICR was able to raise about 10 million rubles donated by public. Time is running out for the ICR to pay the fine, just over a month. The deadline for payment is April 1st. If by this time there are no donors willing to help the non-governmental museum, a bankruptcy procedure against the ICR will be introduced. Russia will lose a wonderful museum, but the main thing is that the secret of the missing canvases will rest forever with the Center of the Roerichs. The “Novaya” appealed to the Ministry of Culture with a request. We asked to explain why the Ministry of Culture protests any attempts to create a public commission to inspect the current composition of the Roerichs’ collection at the State Museum of Oriental art. Regrettably we have received no answer.